Anyway, I was recently chatting with Martin Kepplinger, who is working on Clans Of Reign, and he was looking to do a similar thing! I won’t go into the fluid sim setup, it doesn’t really matter too much what it is. I have some ideas about how to get rid of these requirements, but not sure if I’ll get back to that any time soon. For the example in this post, I am keeping particle lifetime pretty low (0.8 to 1.0 seconds, using a @life attribute on the source particles, so a 24 frame loop). The simulation is 400 frames long (not all shown here), but that ended up being overkill, I could have got away with a much shorter sim. Going back to my rules, with particles that live 24 frames I must choose a first frame >= 24 (for this example, I’ll choose 44). The last frame needs to be after frame 68, so I’m choosing 90. The technique I’m going to use to improve the looping is somewhat like a crossfade. 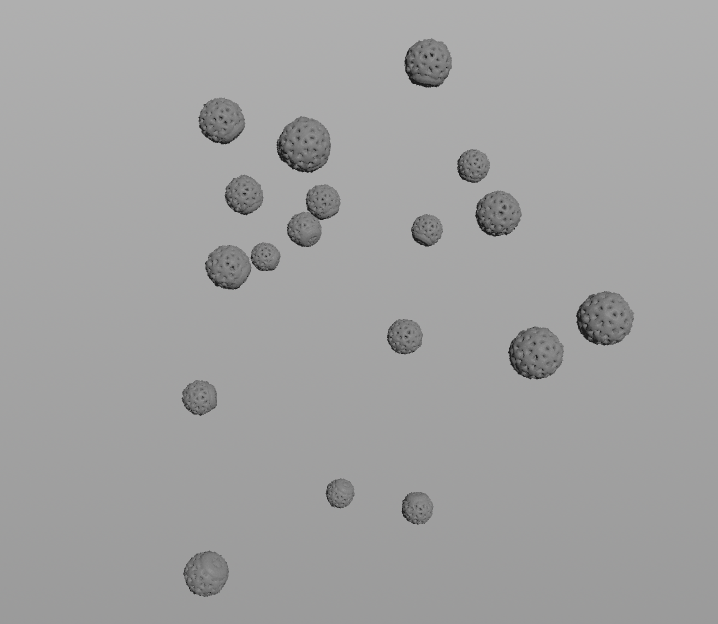 From frames 66 to 90, copying in all the particles that spawn between frame 20 –> 44. This guarantees that all the particles that are alive on frame 89 match exactly with frame 44. 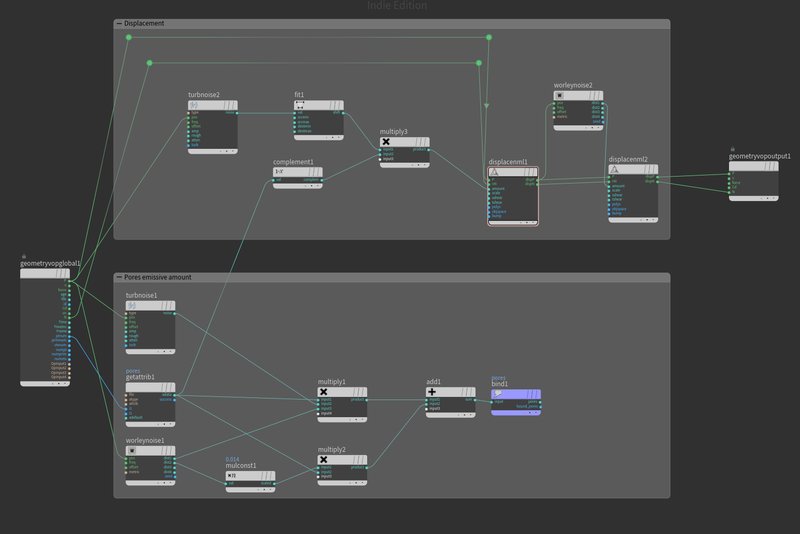 The first part of setting up the looping simulation is picking the start and end frames (first and last) of the loop. The loop setup I chose for the Unity test at the top of the blog was actually a bit different to the range I chose for the breakdowns in the last section. For Unity, I wanted the shortest looping segment I could, because I didn’t want it to be super expensive (memory wise), so I chose start and end frames 25 frames apart. You can see that the frames don’t need to match exactly. The main thing I wanted to avoid was having a huge splash in the bowl at the bottom, or over the edge, because that would be hard to make look good in a short loop. 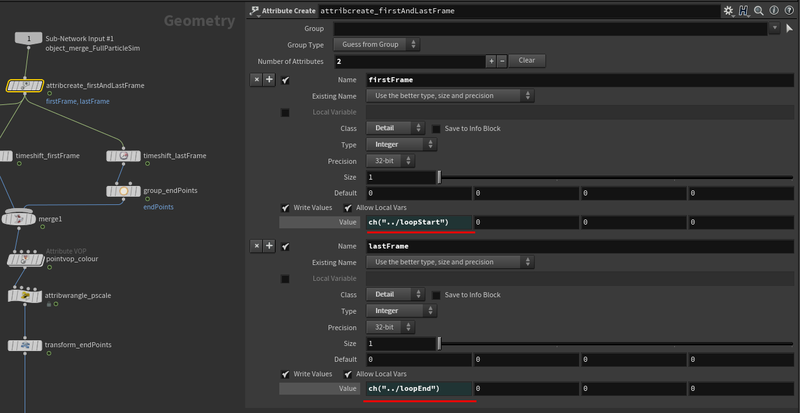 In the screenshot above, you can see that I have First Frame and Last Frame parameters on my FrameFinder network. 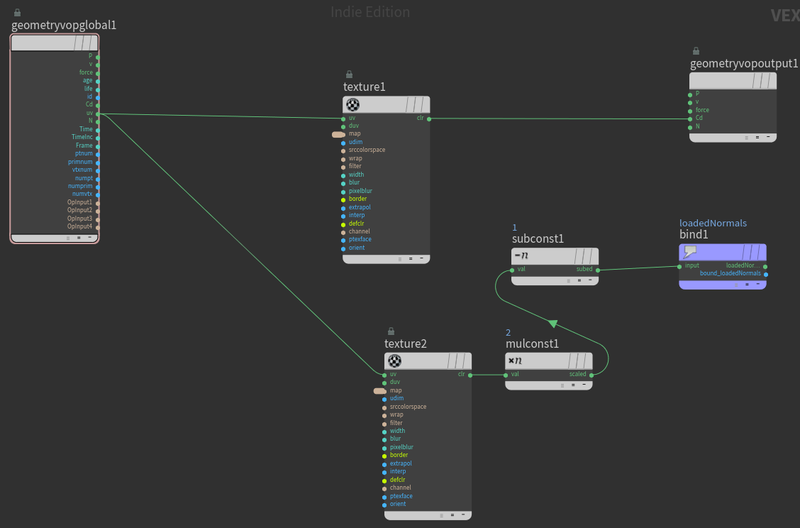 I don’t tend to make my blog posts very tutorial-y, but I thought I’d just take the time to mention that you can put parameters on any node in Houdini. 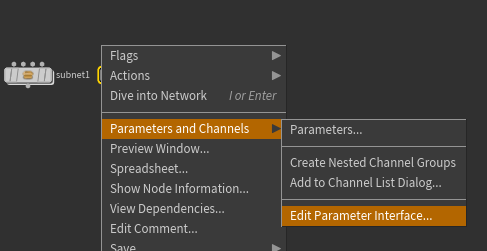 You can then right click on the parameter and copy a reference to it, then use the reference in nodes in the subnetwork, etc. 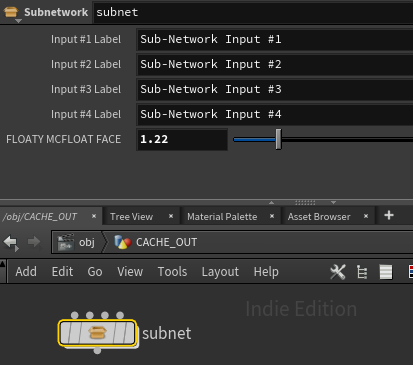 In the edit parameter interface window, you can also create parameters “From Nodes”, which lets you pick an existing parameter of any node in the sub network to “bubble up” to the top, and it will hook up the references. If this is new to you, I’d recommend looking up tutorials on Digital Assets (called “HDAs”, used to be called “OTLs”). I do this all the time on subnetworks like on the FrameFinder, but also to add new fields to a node that contain parts of an expression that would get too big, or that I want to reference from other nodes, etc. On Wrangles (for example), I find myself adding colour ramp parameters a lot for use within the wrangle code. It’s the first time I’ve created multiple outputs from a subnetwork, usually I just dump a “Preview” checkbox as a parameter on the network, but I like this more I think, particularly if I end up turning the whole thing into an HDA. In this project, I’m using Detail attributes to pass around a lot of data, and that starts in with the attribcreate_firstAndLastFrame node. 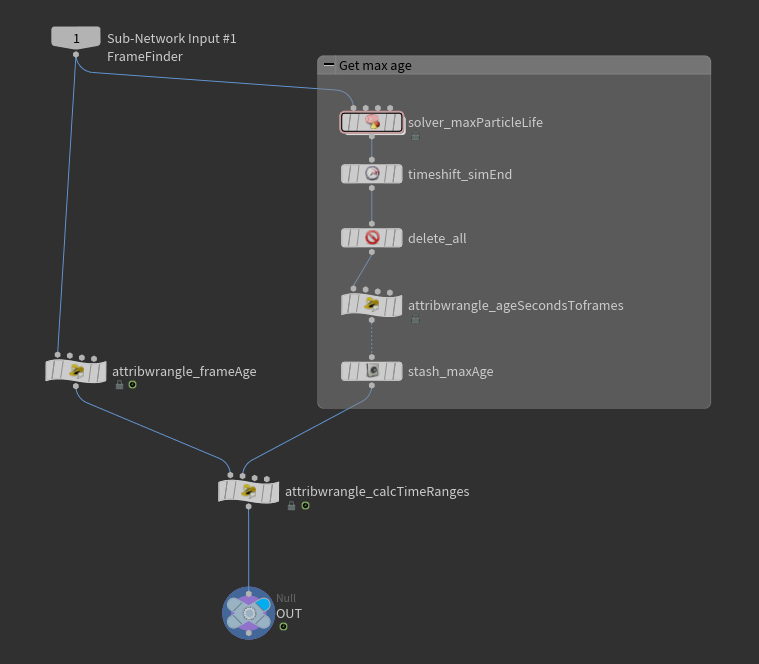 Right under the attribCreate node, I’m using two timeshift nodes: one that shifts the simulation to the first chosen frame, and one to the last frame, and then I merge them together (for the preview output). I’ve grouped the lastFrame particles so that I can transform them off to the right to show them side by side, and also giving all the particles in both frames random colours, so it’s a little easier to see their shape. The nodes in the network box on the right side are used to get the maximum age of any particle in the simulation. For the current frame of particles, it promotes Age from Point to Detail, using Maximum as the promotion method, giving me the maximum age for the current frame. Right after the solver, I’m timeshifting to the last frame, forcing the solver to run through the entire simulation so that the MaxAge attribute now contains the maximum age of any particle in the simulation (spolier: it’s 24 :P). 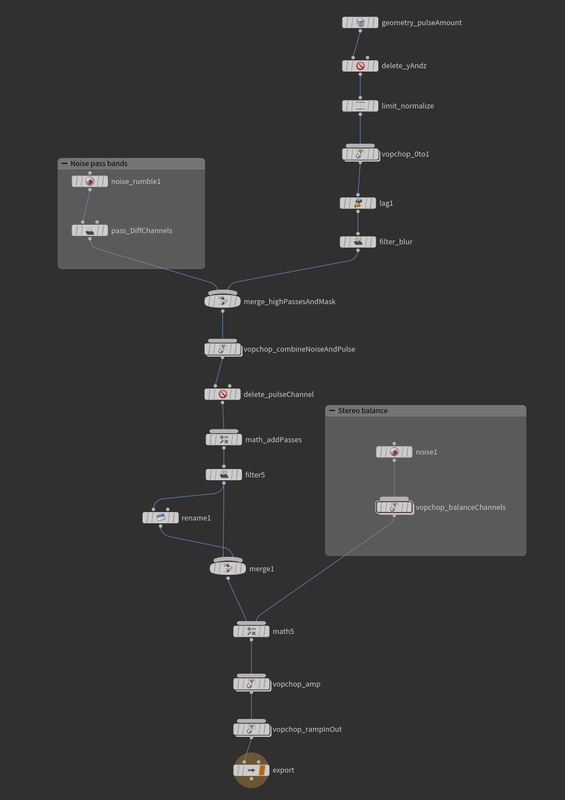 I then delete all the points, since all I care about is the detail attribute, and use a Stash node to cache that into the scene. With the points deleted, the node data is < 12 Kb, so the stash is just a convenient way to stop the maxAge recalculating all the time. If I turn this whole thing into an HDA, I’ll have to rethink that (put “calculate max particle age” behind a button or something). There are two more wrangle nodes in time ranges and ages. When I hit play in the viewport, I want to see just the looping segment of the simulation over and over, so that complicates all this a little. With that in mind, there are 3 important attributes set up here. If my start frame is 20, for example, and the end frame is 60, I want to see the 20-60 frame segment over and over, hence the wrapping loopedFrame temporary variable. So if my viewport time slider is on 15, I really want to see frame 34, the value of remappedFrame will be 34. It will always be a number between firstFrame and lastFrame. This takes the remappedFrame, and shifts it back to before the start of the loop. I only use this value when we hit the last 24 frames of the loop, but I’m clamping it at one just so the timeshift I use later doesn’t freak out. This attribute will be used in the 2nd part of the technique: combining in pre-loop particles. When we are getting into the last 24 frames of the loop, this value increases from 0 to 24. It’s used in the 1st part of the technique to stop spawning particles that have an age less than this value. 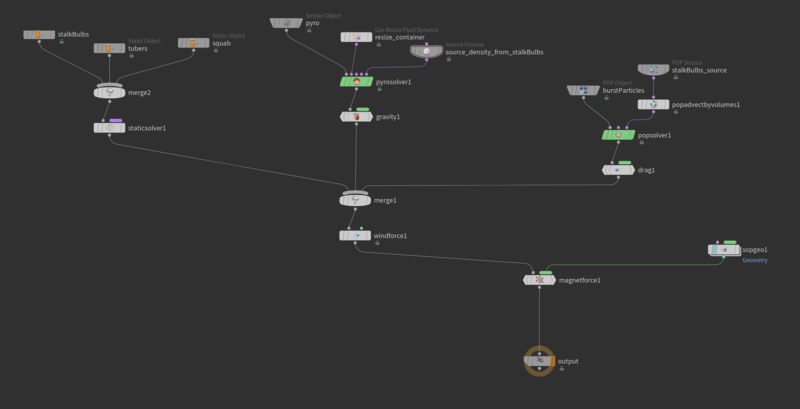 I’ve colour coded the nodes in the network with the same colours I’ve shown in the gifs in the technique section. Since I’ve timeshifted the simulation, the detail attributes get time-shifted too. But I don’t really want that, so I’m attribute transferring the two detail attributes I care about (remappedFrame and numberOfFramesIntoBlend) back onto the remapped sims using Attribute Transfer. After the attribute transfers, on both sides I’m creating a new point group called inBlendingFrames. 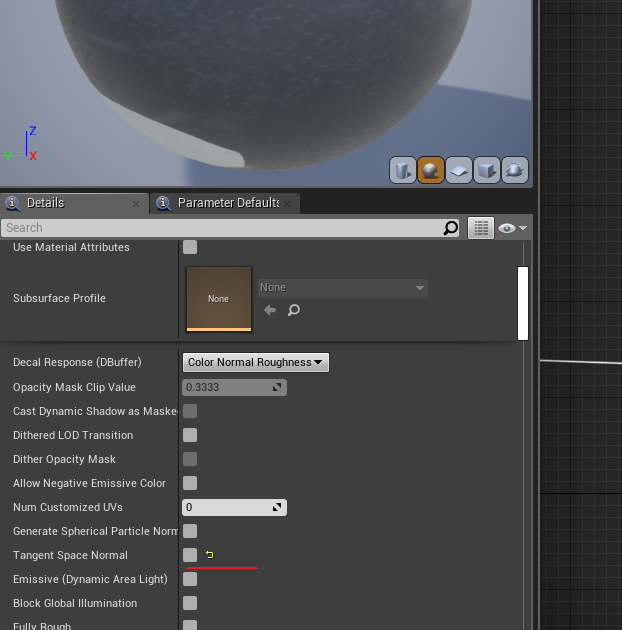 I probably didn’t need a point group for this, considering every particle is either in or out of this group on a given frame, it just made life easier with the Split node I use on the left. On the left side, I do a split using inBlendingFrames. When we’re not in the blending range, we don’t have to do anything to the particles, so that’s the blue colour node. 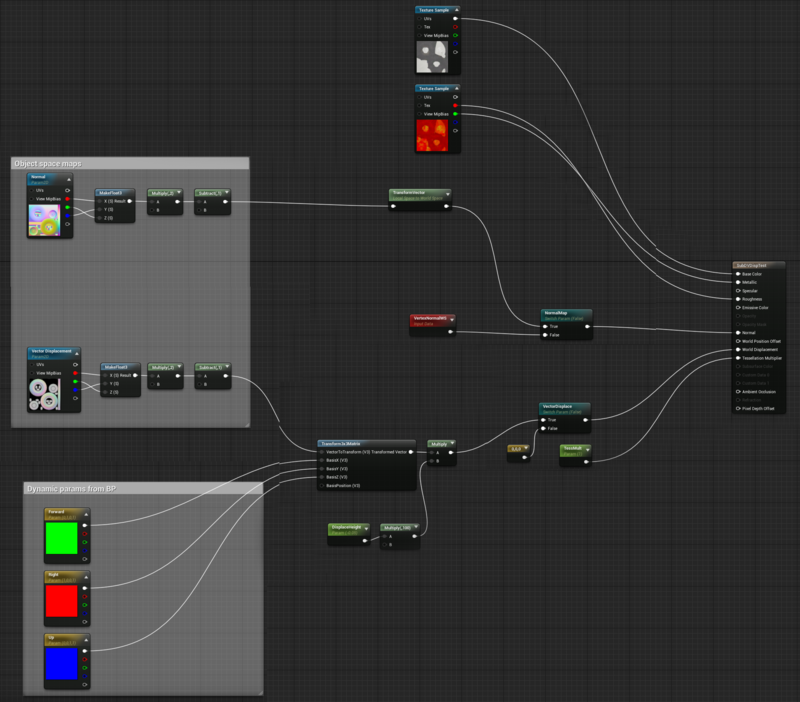 For both the red and green nodes section, I start with deleting anything not in the inBlendingFrames group. For the green particles (the pre-loop particles that we’re merging in), we’ve already got the right frame, due to the timeshift up the top. If we’re on blending frame 2 of the blend (for example), we will still have particles that were spawned 24 frames ago, but we really only want particles that should spawn after the blend starts. Here’s what that looks like for a frame about halfway through the blend. So, I merge the red, blue and green particles all together, and we end up with the result I showed in the technique section! 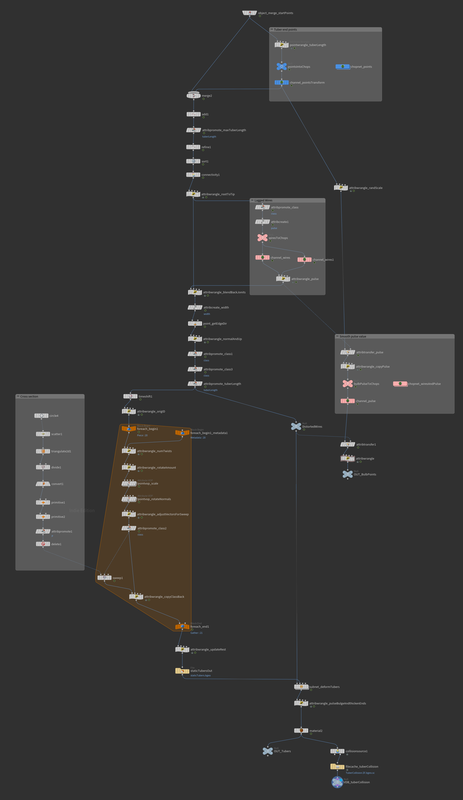 This post is already crazy long, so I’m just going to gloss over the Houdini –> Unity stuff. If anyone is really interested in those details, I might do another post. I exported the range of frames as an Alembic file, and imported it into Unity with the Alembic plugin. As a last little thing, I packaged the network up a lot neater, and dumped it in a loop that ran the process on 16 different 46 frame range segments of the original simulation. The idea being, why try to find good first and last frames when you can just go for a coffee, and come back and have 16 to choose from! I’ve been hoping for edge creased Catmull-Clark subdivision in game engines ever since I started using Modo about 10 years ago. This was not a very useful thing to do. It is unclear if they shipped edge-creasing in any of their released games, but they definitely use CC subdivision surfaces. Creasing gives you control over the sharpness of edges, without having to manually bevel all of your edge loops. This is nice for keeping a low poly mesh, but also allows you a little more flexibility. 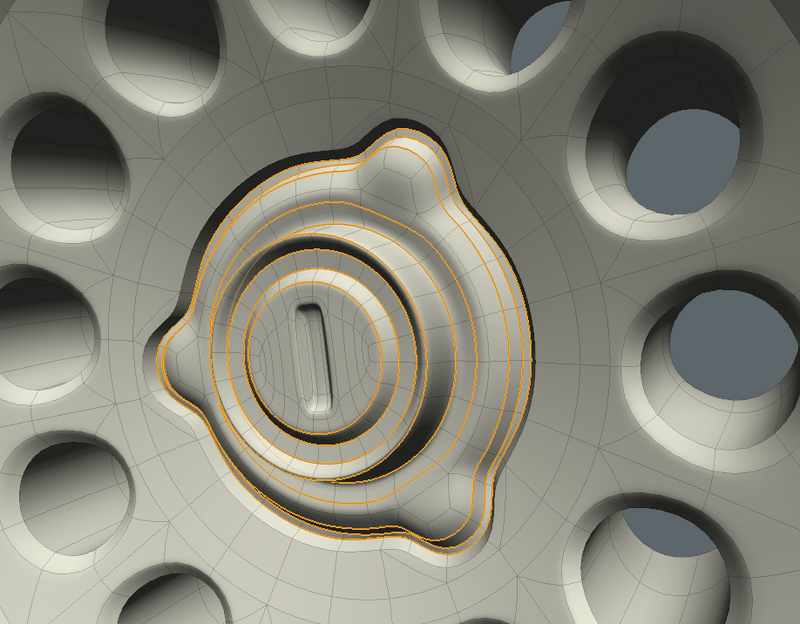 For example, if you come back and change the model, you don’t have to un bevel and re-bevel edges. If you bake out a normal map, and decide the bevels aren’t quite wide enough, you can just change the crease value and re-bake. If I were to bevel those edges instead, my base model would go from 3924 vertices to 4392. 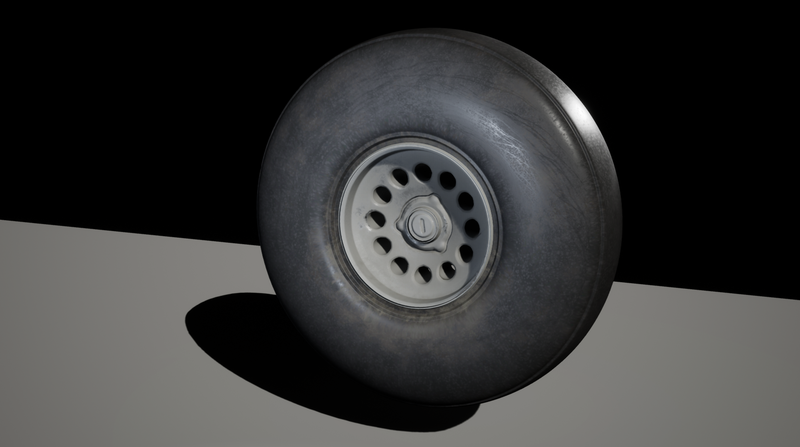 If I removed creases across the whole model, and beveled all the edges to get the same end result I’d need a base mesh around 6000 vertices (2000 vertices more than the creased version). 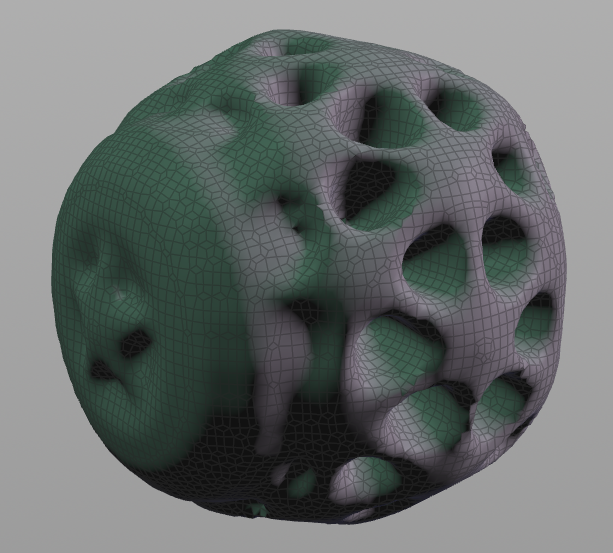 There are two things I want to bake out of Houdini: A vector displacement map and a normal map. I’m not baking this data by projecting a high poly model onto a low poly, I don’t need to because the high poly model is generated from the low poly, so it has valid UVs, I can just bake textures straight out from the high poly. The right side of the graph, there are two Subdivide nodes. 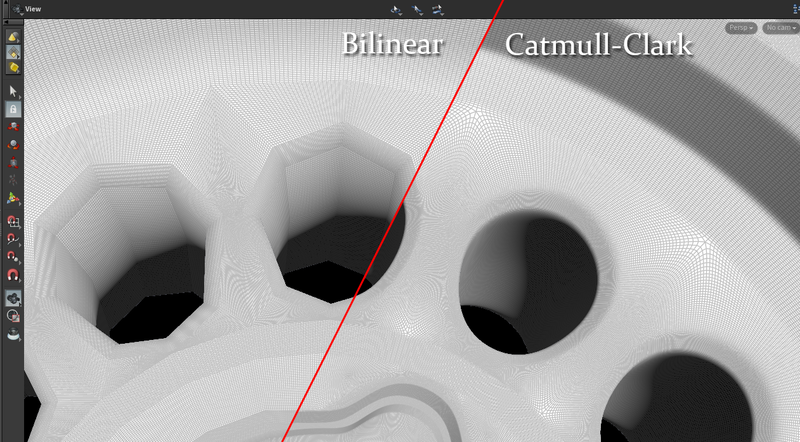 The “bilinear” subdivision is pretty close to what you get in UE4 when you use “flat tessellation”. 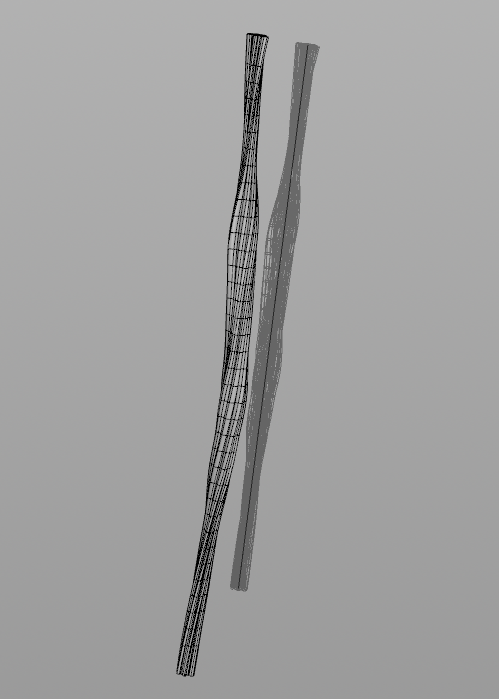 So what we want to do is work out how to push the vertices from the left model to match the right model. 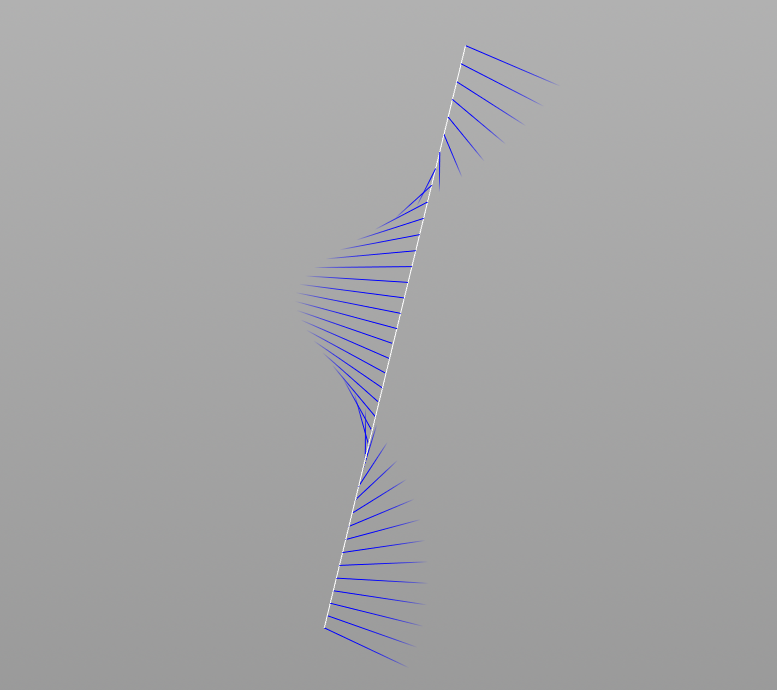 Vector displacement (vDisp) is the flat model point position minus the creased model point position. I am also setting the normals of the flat model to match the creased model. When I save out the vector displacement, I want it in the 0-1 value range, just to make my life easier. So in the above Wrangle/VOP I’m also working out for each Point what the largest dimension is (maxDimen). You might have noticed that the Normals and Displacement are in World space (since that’s the default for those attributes in Houdini). I could have baked them out in Tangent space, but I decided for the sake of this test I’d rather not deal with tangent space in Houdini, but it’s worth mentioning since it’s something I need to handle later in UE4. 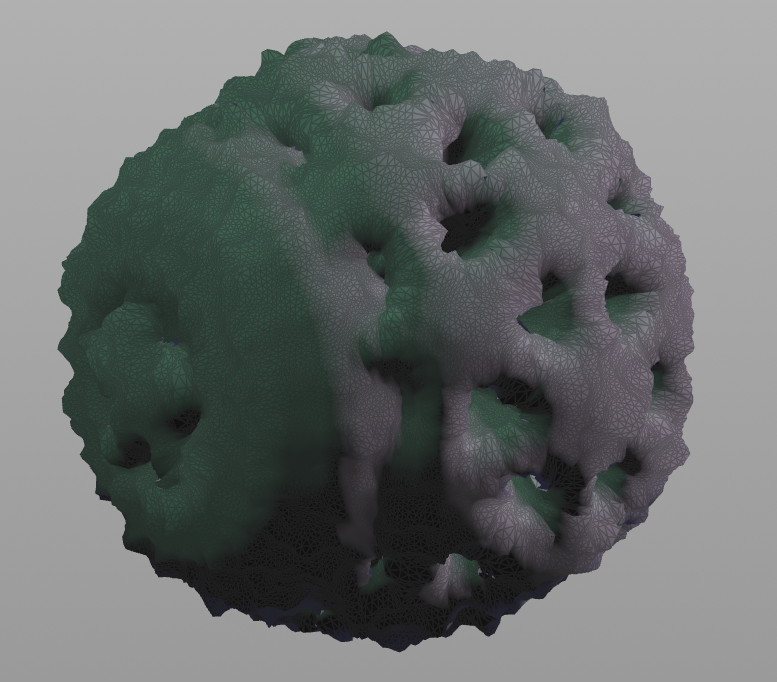 To bake the textures out, I’m using two Bake Texture nodes in a ROP network in Houdini. 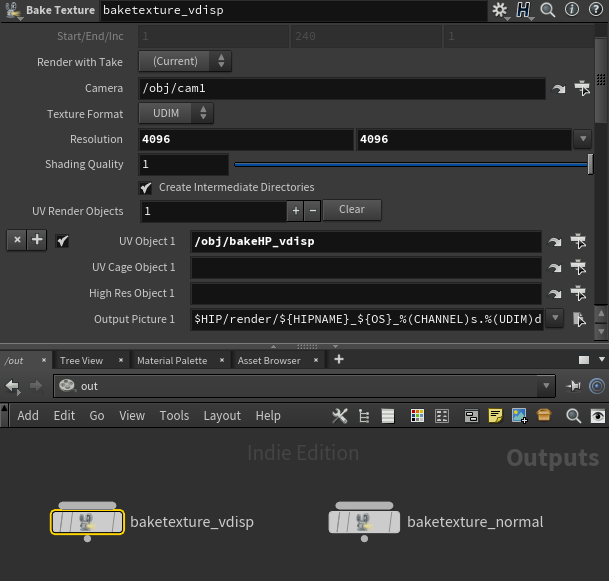 I bake them out as 4k, but lodbias them down to 2k in UE4 because 4k is a bit silly. Well, 2k is also silly, but the unwrap on my model is terrible so 2k it is! I created this test part of the network before I jumped into UE4, so I could at least validate that the vector displacement map might give me the precision and resolution of data that I would need. I’m taking the flat tessellated model, loading the texture using attribvop_loadTexture, copying the globalMaxDimens onto the model, and then the attribwrangle_expectedResult does the vector displacement. This uses the Vertex UVs to look up the vector displacement map texture, and stores the displacement in vertex colour (@Cd). It also loads the object space normal map, and moves it from 0-1 to -1 to 1, and binds it to a temporary loadedNormals attribute (copied into @N later). If you’re wondering why I’m doing the (0 –> 1) to (-1 –> 1) in this Wrangle, instead of in the VOP (where I did the same to the normal), it’s because it made me easier to put the reimportUvsTest switch in. There are some errors, and they are mostly around UV seams and very stretched polygons. The differences are not severe enough to bother me, so I haven’t spent much time looking into what is causing it (bake errors, not enough precision, the sampling I’m using for the texture, etc). 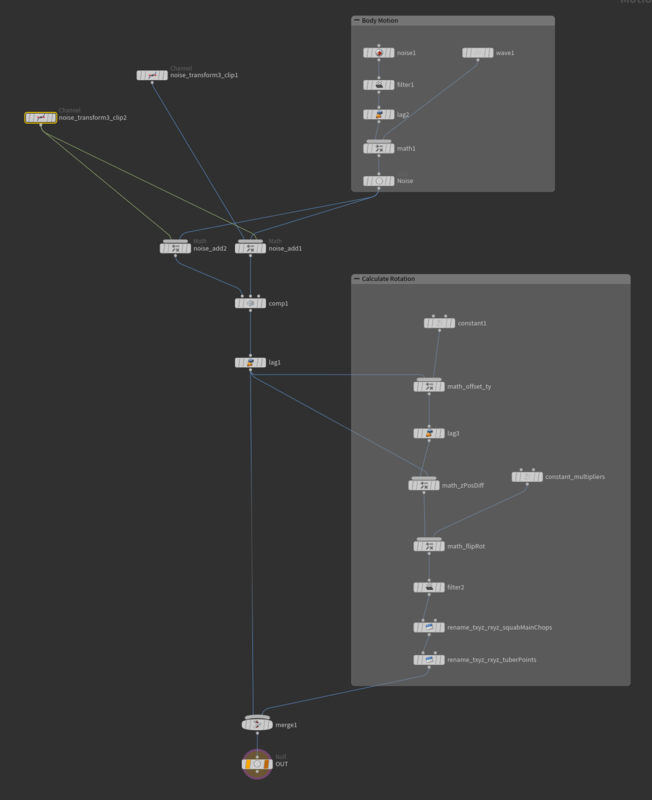 That’s enough proof in Houdini that I should be able to get something working in engine, so onwards to UE4! In UE4, I import the textures, setting the Compression on the Vector Displacement Map to be VectorDisplacementmap(RGBA8), and turn off sRGB. That might be also be solved through more aggressive texture Border Expansion when baking, though. 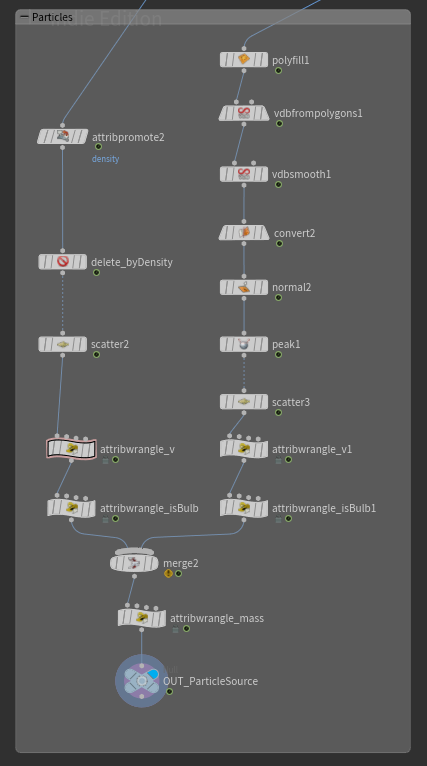 The value for the DisplaceHeight parameter is the @globalMaxDimen that I worked out in Houdini. Since both textures are Local (Object) space, I need to shift them into the right range (from 0-1 to -1 to 1), then transform them into World space (i.e, take into account the objects rotation and scale in the scene, etc). The Transform node works fine for converting local to world for the Normal map. 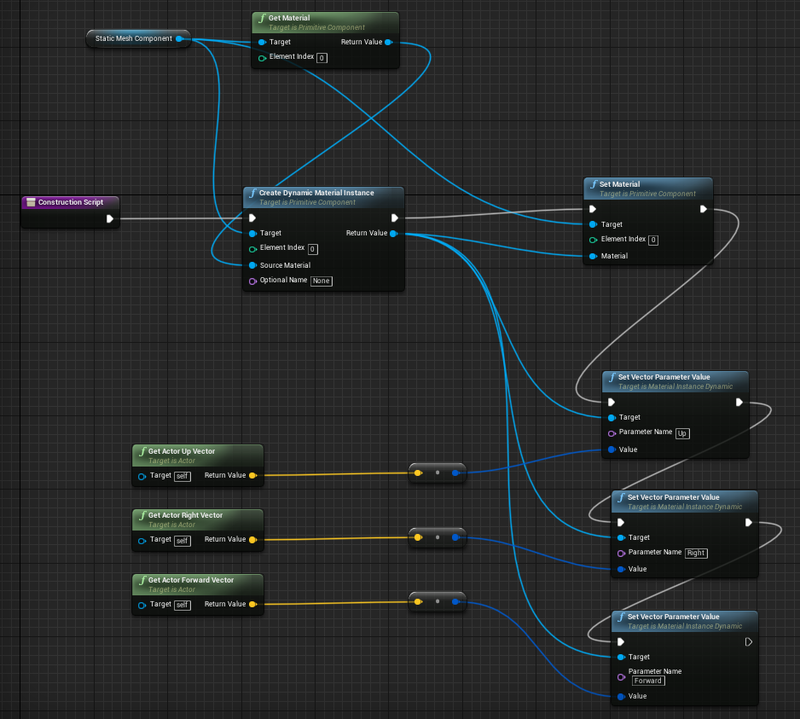 The Transform node works fine for normal maps, but does not work for things that are plugged into World Displacement. Tessellation takes place in a hull / domain shader and the Local -> world transformation matrix is not a thing it has access to. 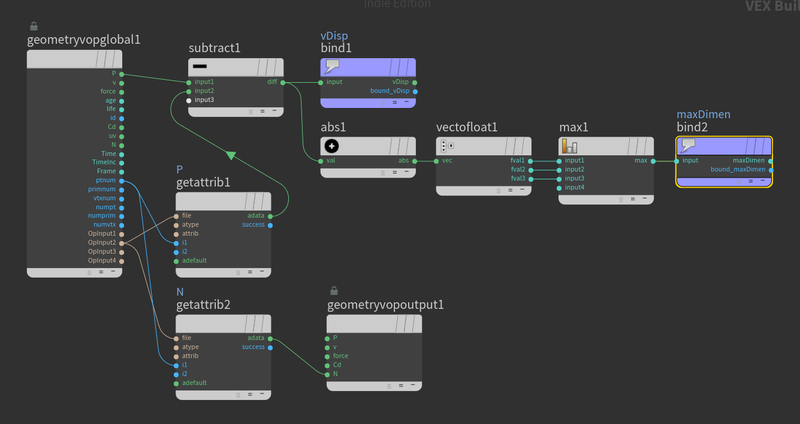 To solve this properly in code, I think you’d probably need to add the LocalToWorld matrix into the FMaterialTessellationParameters struct in MaterialTemplate.usf, and I imagine you’d need to make other changes for it to work in the material editor, or you could use a custom node to access the matrix. If you look back at my material, you can see I didn’t do that: I’m constructing the LocalToWorld matrix from vectors passed in as material parameters. 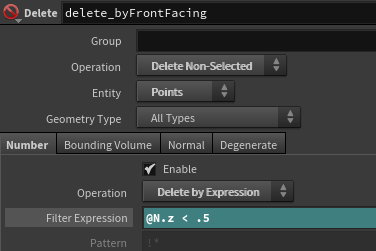 I’m creating a dynamic material instance of the material that is on the object, applying this new instance to the object, and setting the Up, Right and Forward vector parameters from the Actor. These vectors are used in the material to build the local to world space matrix. Please ignore the albedo texture stretching, I painted it on a medium divided high poly mesh in Substance Painter, probably should have used the low poly (something for me to play with more at a later date). This is with a directional light and a point light without shadows. 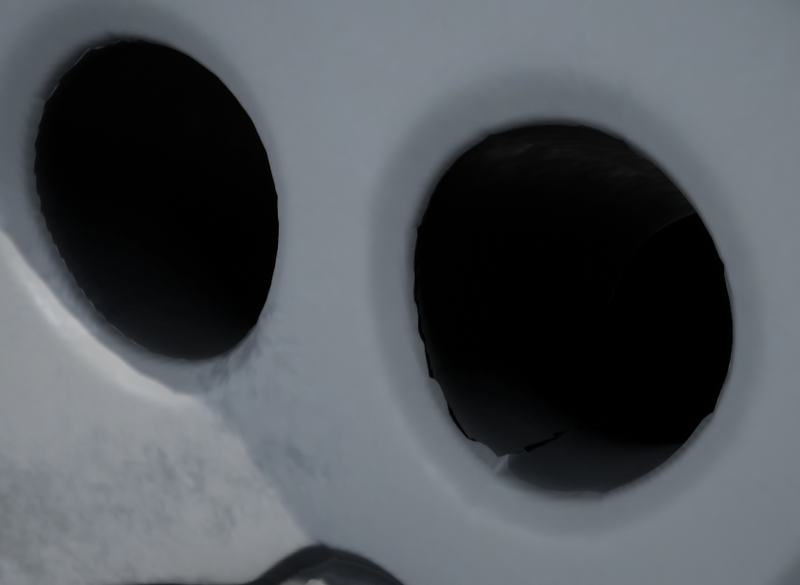 As a side note, Point Light shadows don’t seem to work at all with tessellated objects in UE4. Spotlight and directional light shadows work ok, with a bit of a caveat. 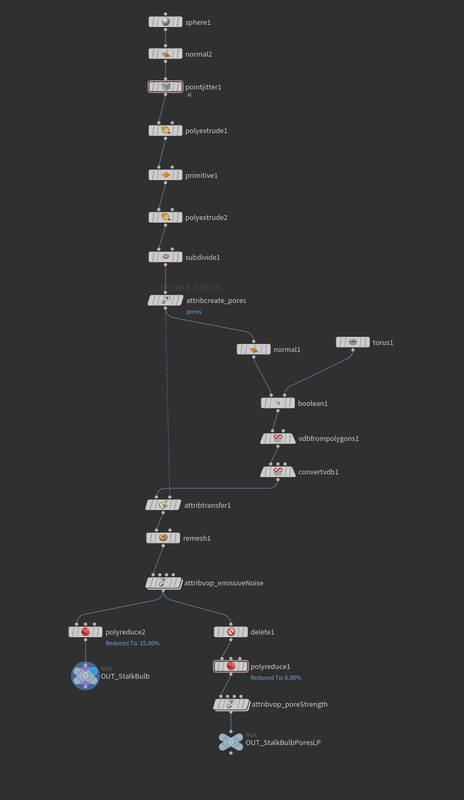 Seems like a lot of work for something that is not super useful, but it’s better than my last attempt, and being built in Houdini it would be very easy to turn this into a pipeline tool. Last post was about smoke, particles and weird looking ball things. This post is about the audio for the video. I wanted to make a sort of windy / underwater muffled sound, and managed to get somewhat close to what I wanted, just using Houdini CHOPs! I decided not to create the audio in the same hip file, since it was already getting a bit busy, and because the data I want to use is already cached out to disk (geometry, pyro sim, etc). 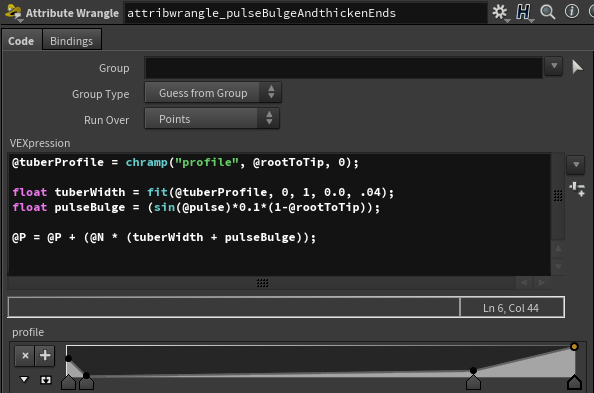 The new hip file just has a small geometry network and a chops network. Next I’m promoting the pulse amount from points to detail, using “sum” as the promotion method (this adds up all the pulse amounts for all points in the bulbs every frame). I don’t care about the geometry any more, because the sum is a detail attribute, so I delete everything except for a single point. 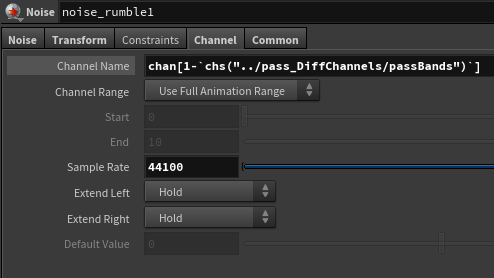 I had a bit of a hard time working out how to bring the values of a detail attribute into CHOPs as a channel. I think it should be simple to do with a Channel CHOP, but I didn’t succeed at the magic guessing game of syntax for making that work. I had some idea of what I wanted, and how to make it work, from experiments in other software (Supercollider, PureData, etc). I found that creating an interesting wind sound could be achieved through feeding noise into a lowpass filter. 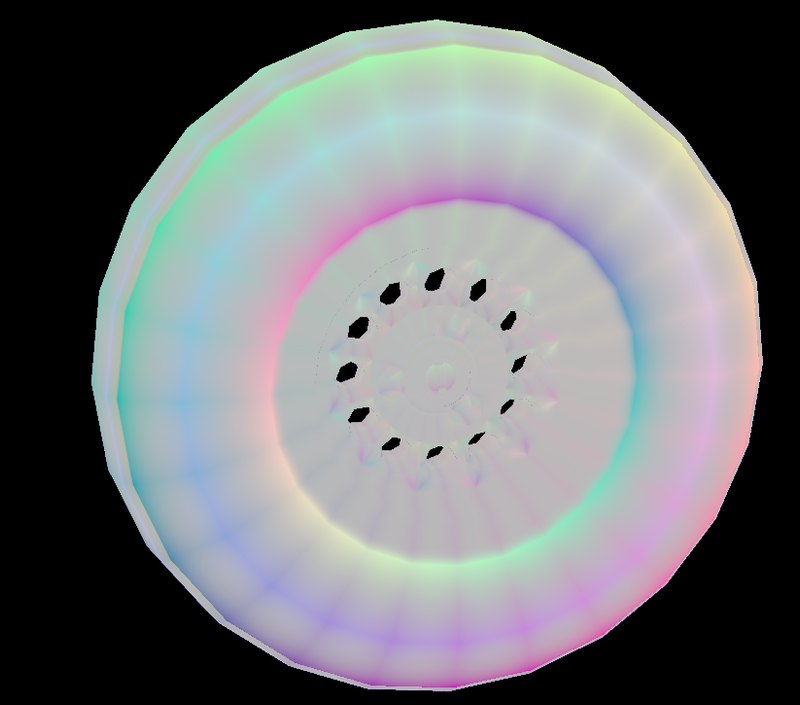 It’s pretty gross, doesn’t work in webgl, and is probably very expensive. With that running, you can mess with the stereo pan and pitch on the Audio Source, for countless hours of entertainment. 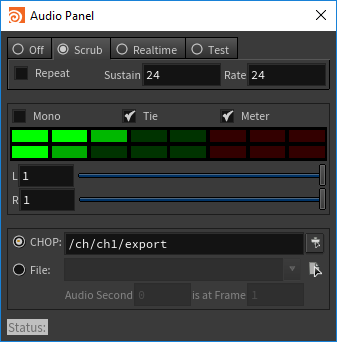 When testing out Audio in a hip file, I could only get it to play if I use the “Scrub” tab in the audio panel. You should also make sure that the values you output are clamped between -1 and 1, otherwise you’ll get audio popping nastiness. 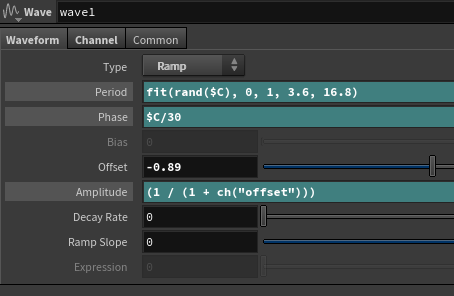 What I’d set up in Unity was a channel of noise that is run through a High Pass filter with a varying Cutoff amount. 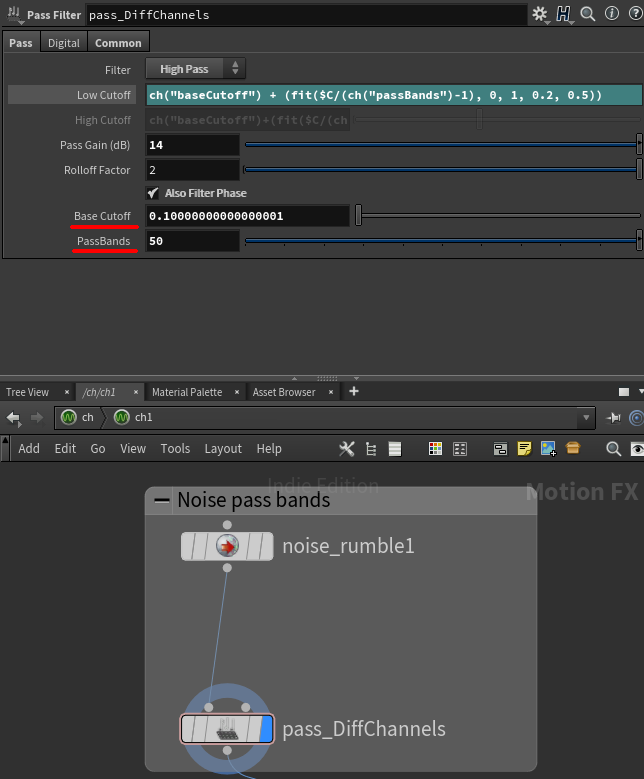 I was hoping that the whole waveform would be modified so I could visualize the results in Motion FX View, but what I found instead is that the waveform was modified by the current frames noise value in Motion FX. It’s likely that it would still have given me the result I wanted, but having the wave form jump around like that, and not being able to properly visualize it was pretty annoying. 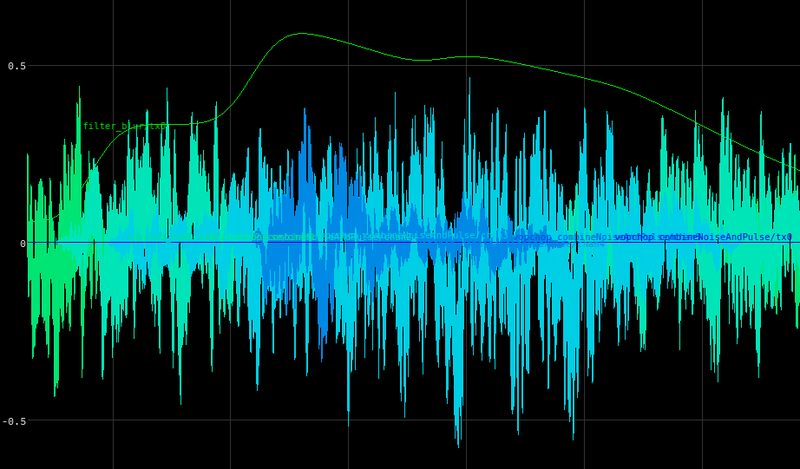 So, instead of creating noise to vary the high pass cutoff, I instead created a bunch of noise channels, and gave each of them their own high pass cutoff, then I blend those together (more on that part later). 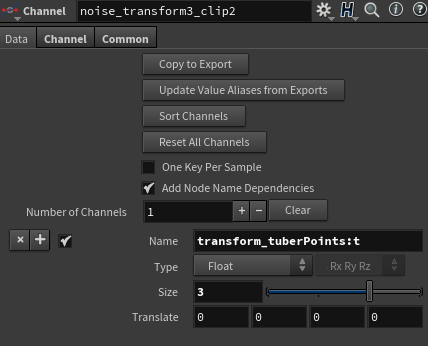 In the Transform tab of the noise, I’m using $C in the X component of the Translate, to offset the noise patterns, so each channel is a bit different. In hindsight, using $C in the “seed” gives a better result. So now I have some channels of filtered noise! 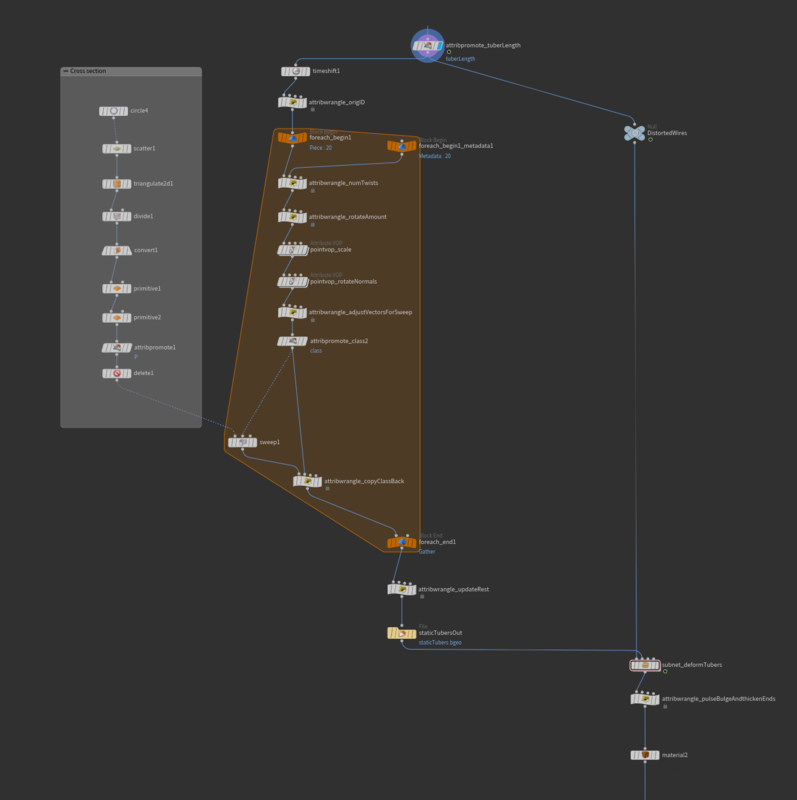 The top right part of the CHOP network is importing the pulse value that I set up earlier. I’m importing a single point, and the pulse value was copied into Position, as mentioned earlier. I’m deleting the Y and Z channels, since they are the same as X, normalizing the data using Limit, moving the data into the 0-1 range, and then lagging and filtering to soften out the data a bit. So this pulse channel is tx0, and I merge that in with all the noise channels (chan1-x). 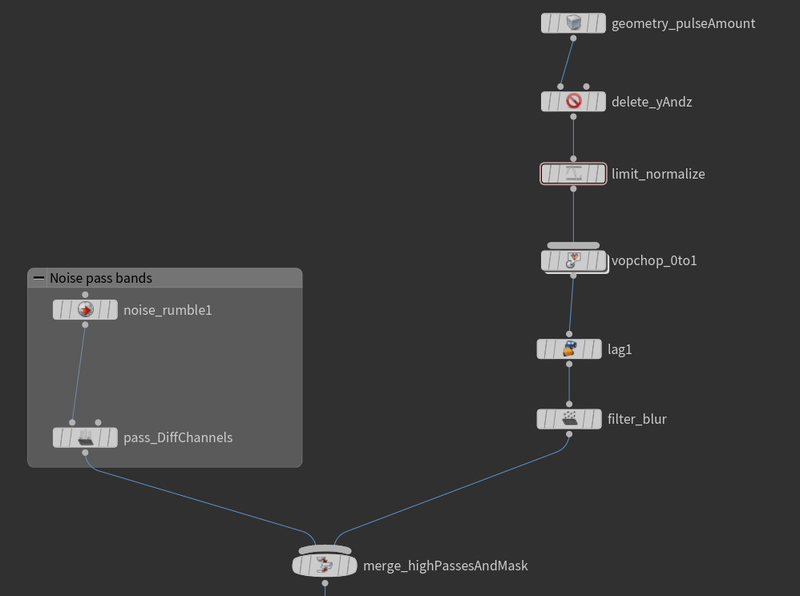 I want to use the value of this pulse channel to blend in the noise channels I previously created. So, for example, if I have 4 bands: between 0 and 0.25 pulse value I want to use band 1 noise, between 0.25 and 0.5 I’ll use band 2, 0.5 and 0.75 use band 3, etc. I didn’t want a hard step between bands, so I’m overlapping them, and in the end I found that having quite a wide blend worked well (I’m always getting a little of all noise channels, with one channel dominant). 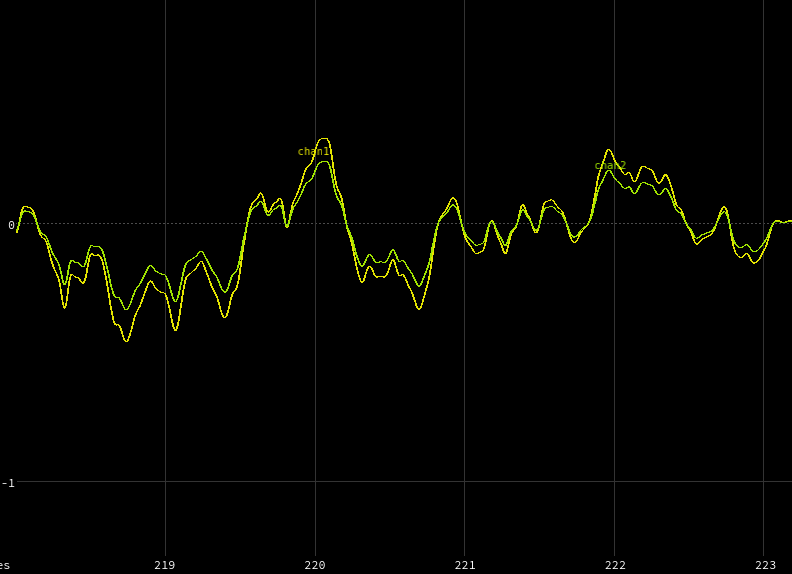 The left side of the network is working out the band midpoint ((1 / number of channels) * 0.5 * current channel number). The middle section gets the current pulse value, and finds how far away that value is from the band midpoint for each channel. 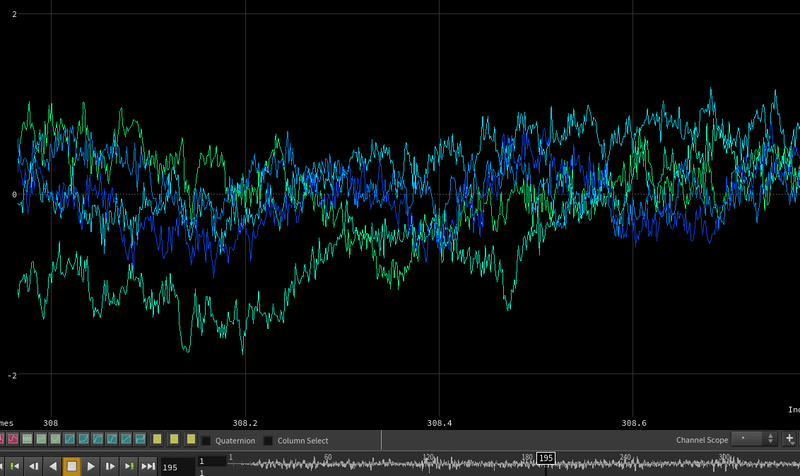 As the red line increases, it goes through the midpoints of each noise band, and the corresponding noise channel increases in intensity. Since I’ve lowered the overlap for this image, there are actually gaps between bands, so there are certain values of the pulse that will result in no noise at all, but that’s just to make the image clearer. With that done, I delete the pulse channel, and I add all the noise channels together. The last thing I’m doing is outputting the noise in stereo, and for that I’m just arbitrarily panning the sound between two channels using noise. There’s a few other little adjustments in there, like making sure the amplitude is between -1 and 1, etc. Hopefully you’ve enjoyed this series breaking down the squab video and my adventures in CHOPs. I can’t imagine I’ll use it for audio again, but it was definitely a fun experiment. Last post, I talked about the tubers, their animation and creation of the pulse attributes. 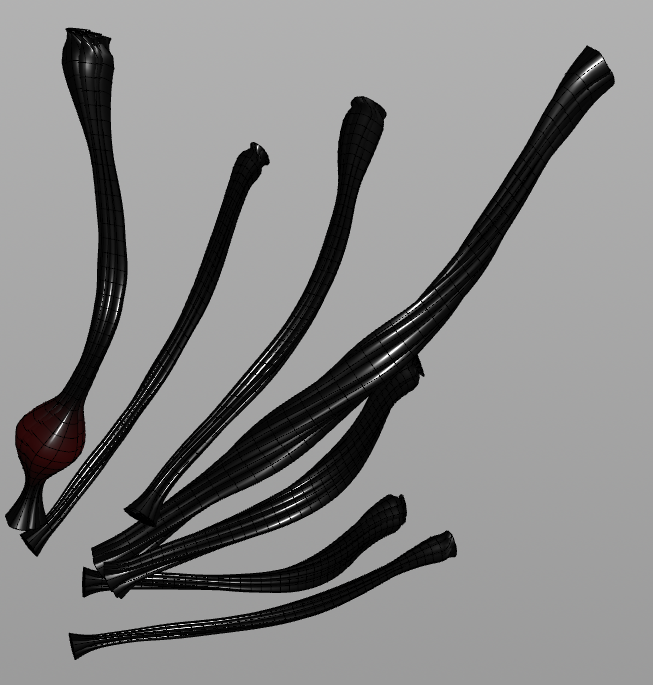 This post will be about the bulbs on the end of the tubers, the pyro and particles setup. Since you don’t really get a close look at the tuber bulbs, considering the lighting and pyro cover them quite a bit, all of the bulbs have the same geometry. This is a rather silly thing to do procedurally, I should have just sculpted something for it. 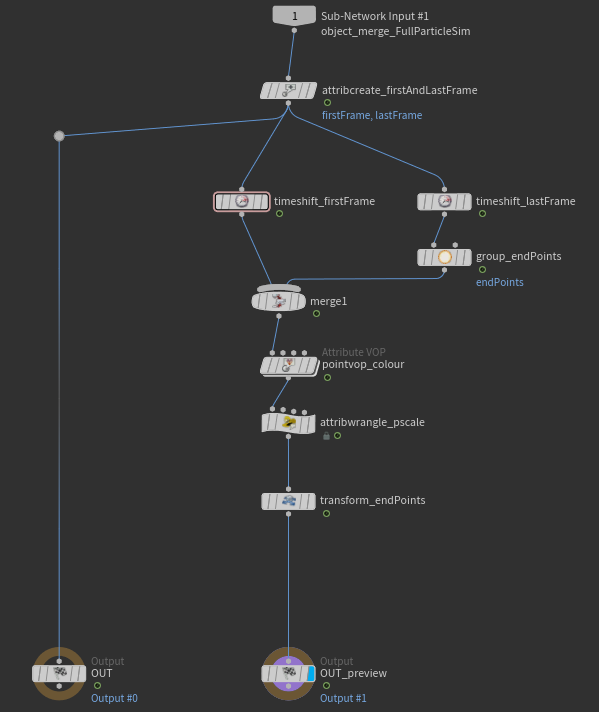 Because problem solving in Houdini is fun, I tend to do everything in my home projects procedurally, but there are definitely times where that is a) overkill and b) ends up with a worse result. I’m then boolean-ing a torus on one side, which will be where the tuber connects to the bulb. 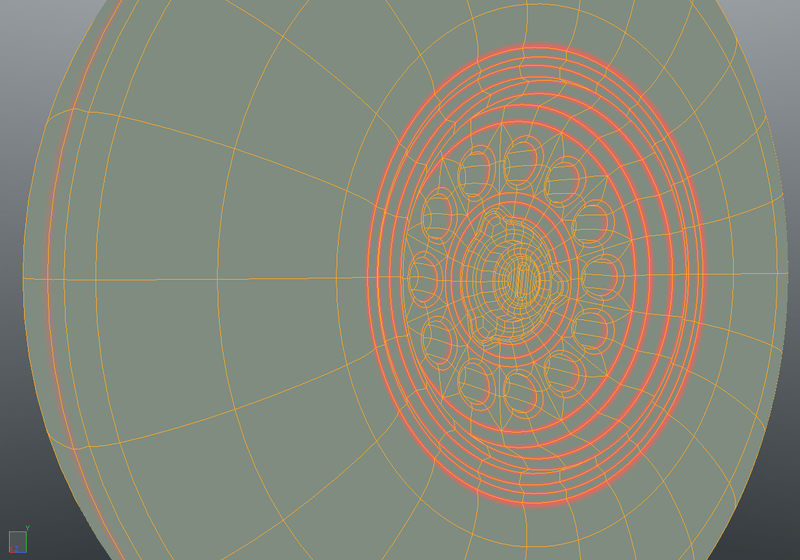 Then I remesh it, and apply some noise in an Attribute VOP using the Displace Along Normal. Before the Attribute VOP, I’ve set up a “pores” attribute, which is set to 1 on the extruded inside faces, and 0 everywhere else. 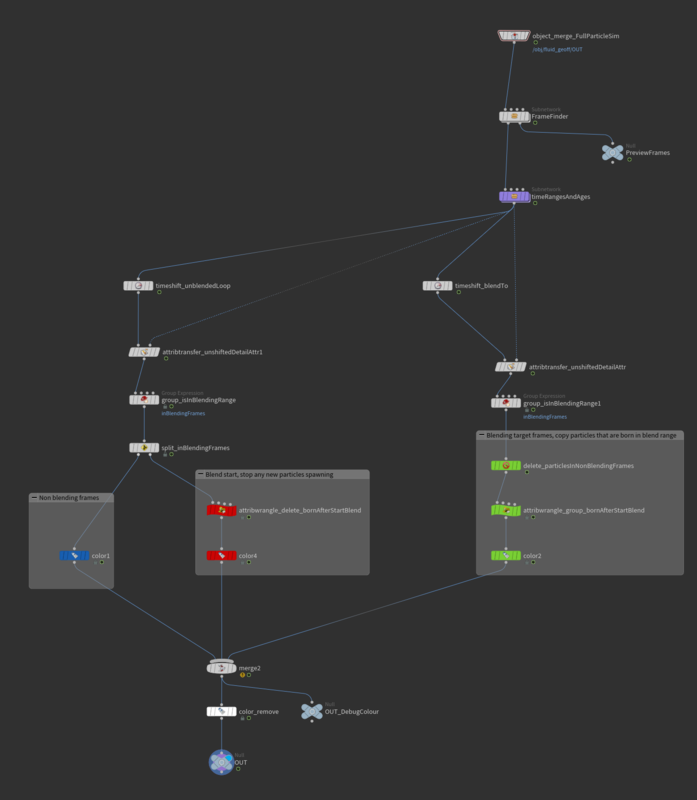 There was a very scientific process here of “add noise nodes until you get sick of looking at it”. I wanted the smoke to look like a cloud of spores, sort of like a fungus sort of thing, with some larger spores created as particles that glow a bit. The source of the smoke is geometry that has a non zero “pulse” attribute (that I set up in earlier posts), but I also just add a little bit of density from the pores on the tuber bulbs all the time. 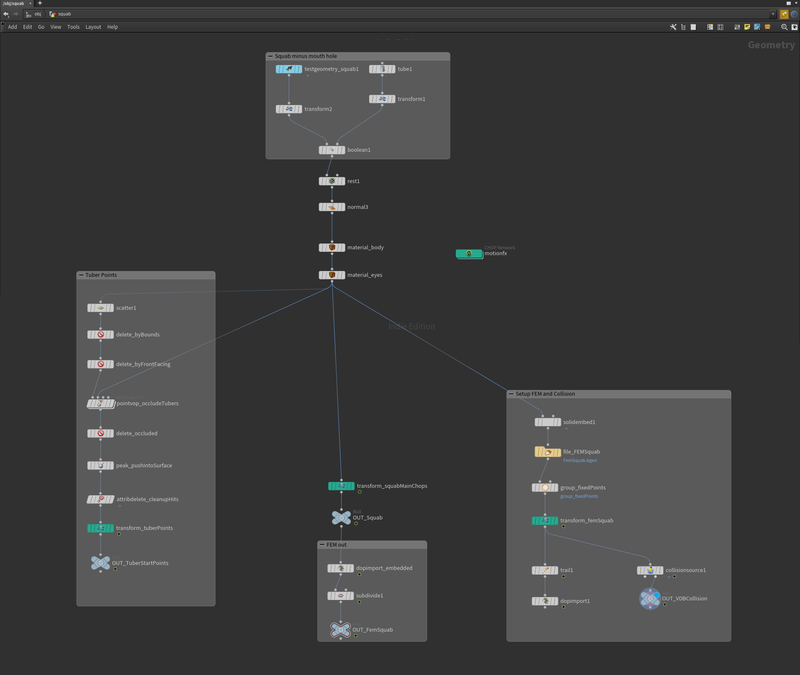 I’m not going to break down the dynamics network much, it is mostly setup with shelf tools and minimal changes. 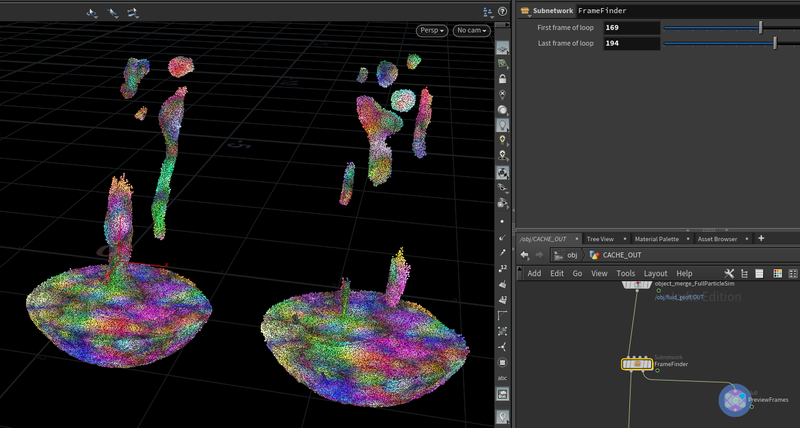 Kind of messy, but on the right I’m capping the tuber sections that I showed before, remeshing them by converting to vdb, smoothing then converting back to polygons, scattering some points, adding velocity and some identifying attributes. On the left side, I’m scattering points on the bulbs when the density (pulse value) is high. In both cases, I’m setting particle velocity to a constant value * @N, so they move away from the surface, and faster from the bulbs than the tubers. Still to come: Breaking down creating audio in CHOPs. Last post, I talked about the motion of the squab, and the points created for the tubers sprouting from its back. 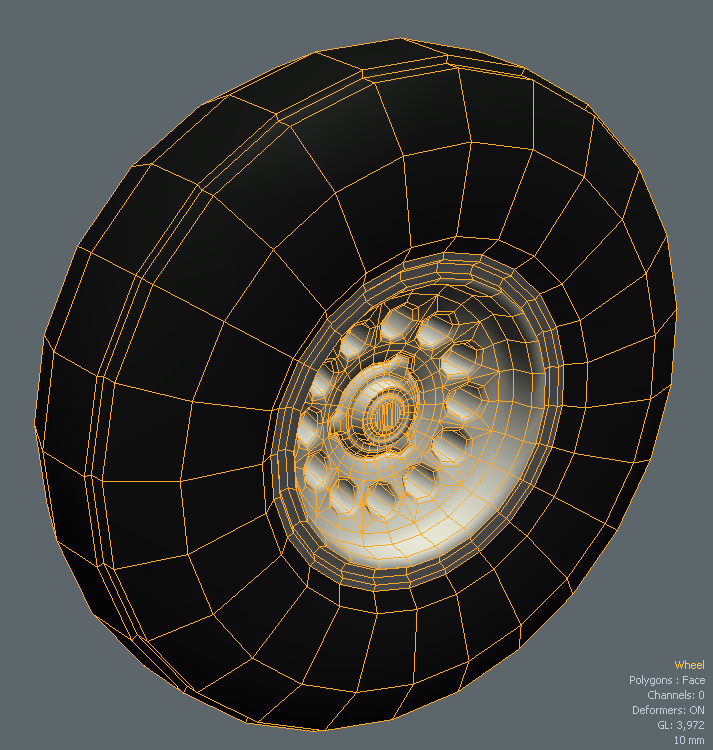 This post will be about the creating the tuber geometry and motion. The Object Merge at the top is bringing in the tuber start points, which I talked a bit about last post. I’m pushing those points along their normals by some random amount, to find the end points. I could have done this with a Peak SOP, but wrangles are far more fun! Sometimes I just find it a lot quicker to do things in VEX, especially when I want to do value randomization within a range like this. The points chopnet, near the top, is straight out of the “Introduction To CHOPs” by Ari Danesh. I highly recommend watching that series for more detailed information on CHOPs. 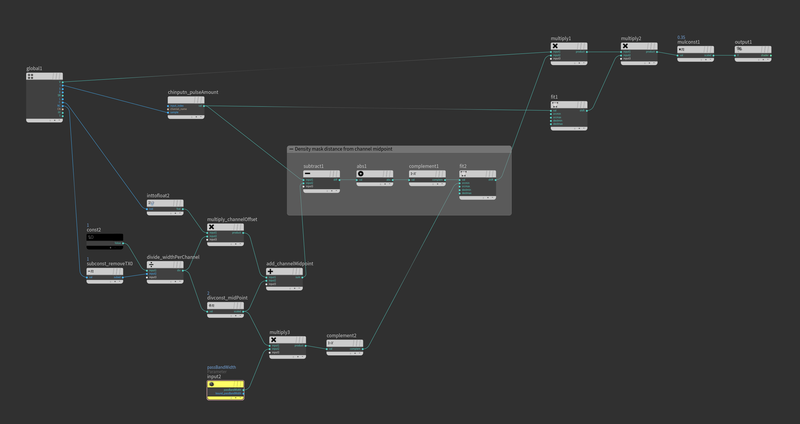 I’m then using Refine to add a bunch of in-between points. In the middle right of the network, there are two network boxes that are used to add more lag to the centre of each wire, and also to create a pulse that animates down the wires. When the pulse gets to the bulb at the end of the tuber, it emits a burst of particles and smoke, but more on that in a later post. The wire lag is pretty simple, I’m just adding some more lag to the movement (which I latter mask out towards both ends of the wire so it just affects the centre). The pulse source is a little more interesting. Before this network, I’ve already created the pulse attribute, initialized to 0. 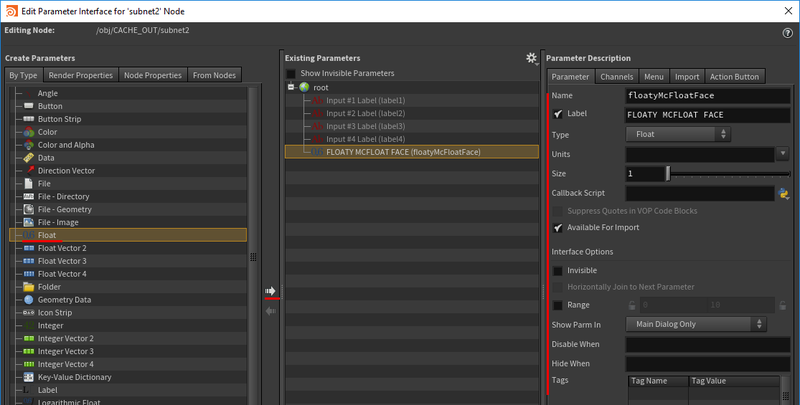 I’ve also created a “class” attribute using connectivity, giving each wire primitive it’s own id. This creates a channel for each wire. 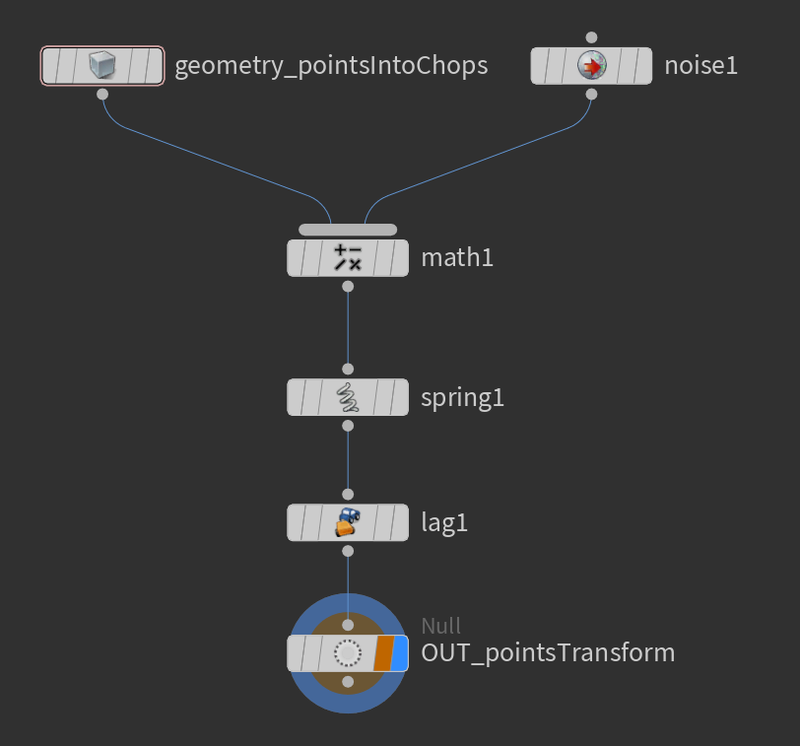 I also have a Wave CHOP with the type set to “ramp”, and in this CHOP I’m referencing the number of channels created by the geometry import, and then using that channel id to vary the period and phase. 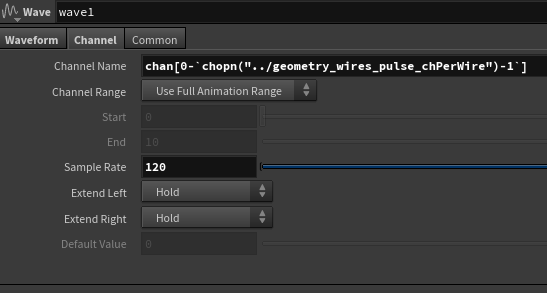 So hopefully this shows that each wire gets a pulse value that is usually 0, but at some point in the animation might slowly ramp up to 1, and then immediately drop to 0. The “Pulse Source Bulbs” section of the chopnet is a copy of the pulse, but with some lag applied (so the pulse lasts longer), and multiplied up a bit. I’m creating the geometry around a time shifted version of the wires (back to the first frame), and then using a lattice to deform the geometry each frame to the animated wires. 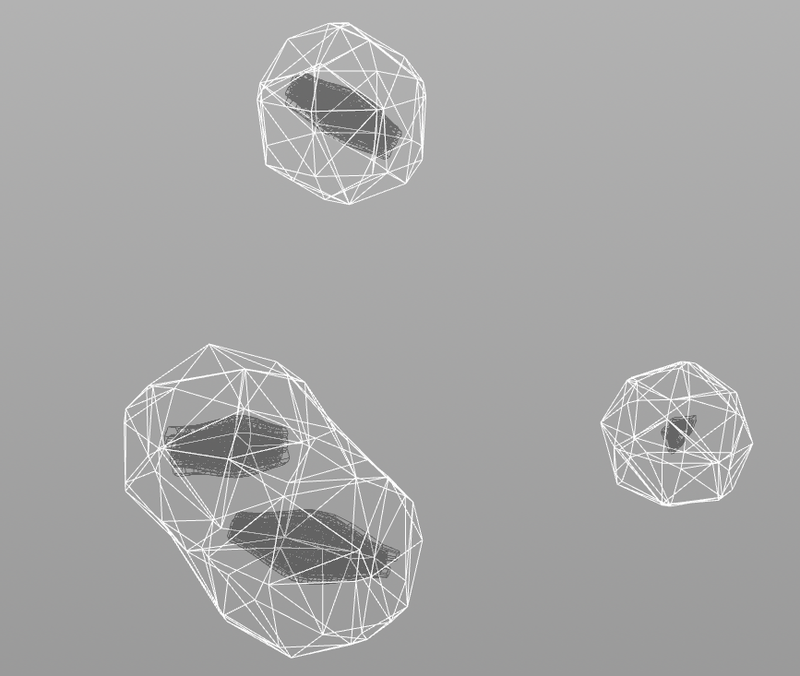 By triangulating a bunch of scattered points, dividing them with “Compute Dual” enabled, convert them to nurbs and closing them, I get a bunch of circle-ish shapes packed together. The Sweep SOP is in a foreach, and there are a few different attributes that I’m varying for each of the wires, such as the number of twists, the scale of the cross-section. The twisting took a little bit of working out, but the Sweep sop will orient the cross section towards the Up attribute of each point. I already have an Up attribute, created using “Add Edge Force” with the old Point SOP, it points along the length of the wire. The Sweep SOP expects the Up vector to be pointing out from the wire, so I swap the Normal and Up in a wrangle before the Sweep. I Lattice each wire separately, because sometimes they get quite close to each other. Last thing I do with the tubers is push the normals out a bit as the pulse runs through. I already have an attribute that increases from 0 – 1 along each tuber, called “rootToTip”. On the wrangle, I added a ramp parameter that describes the width of the tuber along the length (so the tuber starts and ends flared out a bit). That does it for the tubers! 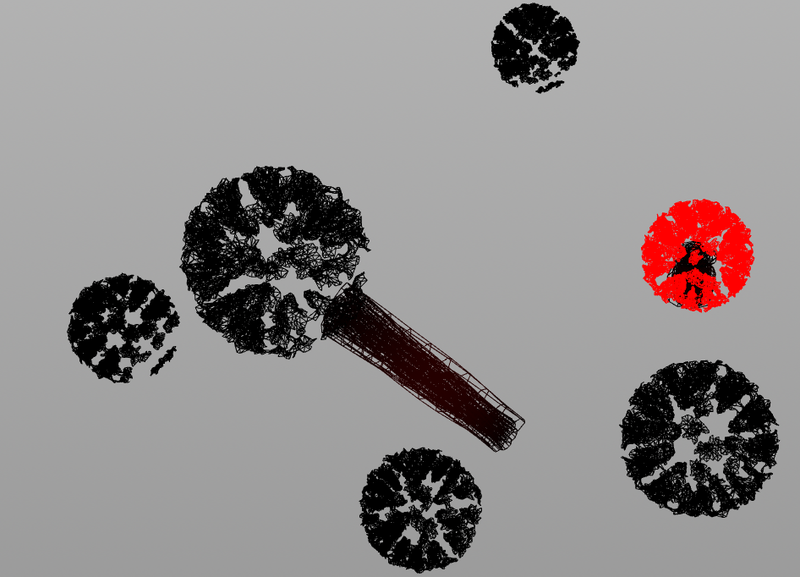 In future posts, I’ll cover the stalk bulbs, particles, pyro, rendering and audio. This series of blog posts will break down how I made it! This first post will be some background on the project, and how I set up the movement of the squab and spawned the initial points for the tubers that are attached to it. This whole thing was a feature exploration of CHOPs that went off the rails a bit. While working on another Houdini rendering project at home, I needed to dynamically re-parent an object half way through an animation. Luckily, there is a shelf tool for that! 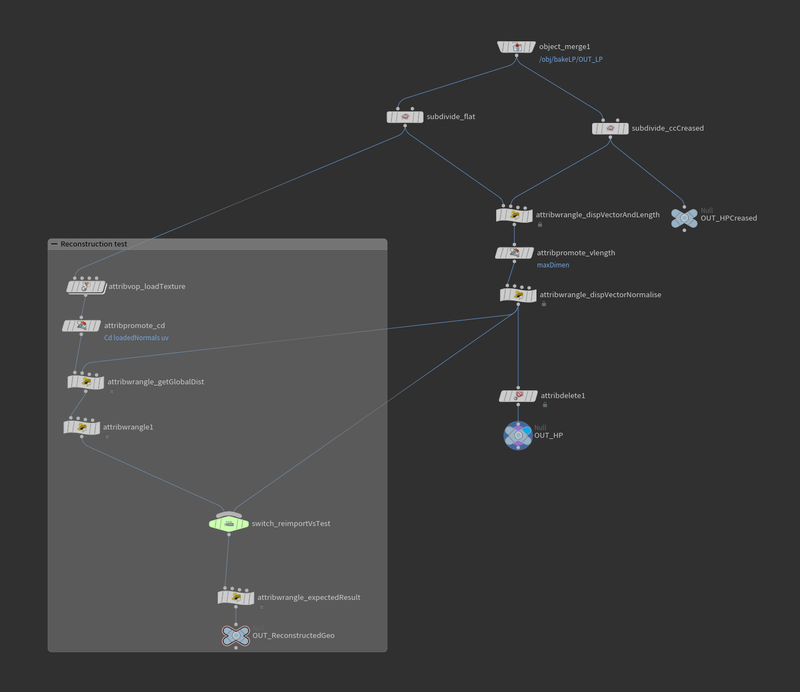 When I ran it, Houdini created a constraints network, and it seemed like nothing else had changed. 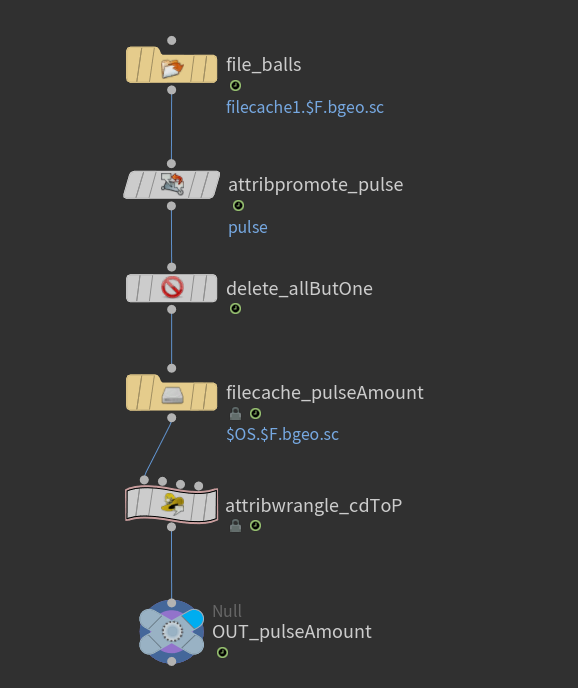 The object was suddenly dynamically parented at that frame, but there were no attributes, or connected nodes, or anything that I would expect to see generated. 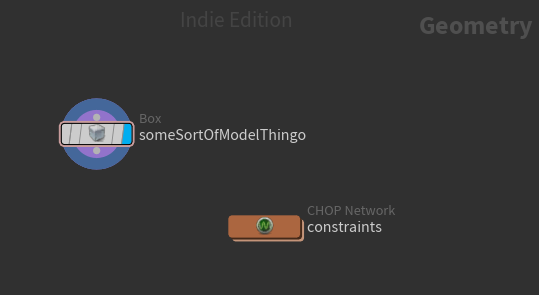 Just a new network, and a reference to the constraints on the geometry node at the obj level. I’ve never really used CHOP networks before, and it seemed like a good time to see how they work. Much like the other contexts in Houdini, there is an endless amount of learning and exploration that can be done here, but I started out watching the great “Introduction To CHOPs” videos by Ari Danesh (@particlekabob). My squab video was the result of me getting distracted and going off on a tangent while watching the training! If you’re interested in CHOPs, I’d really recommend watching those videos. I’m not going to go very in depth over things that Ari already covered. 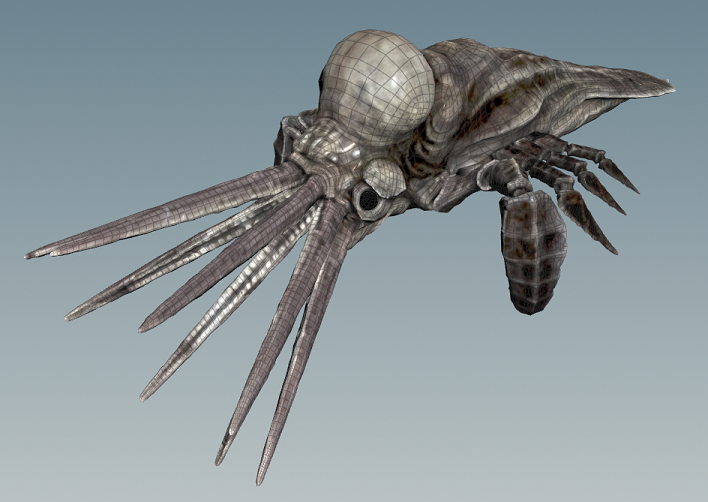 In case you’re not familiar with it, the “squab” is a test asset that ships with Houdini. I decided I wanted to create tuber like growths off the side of it, with bulbous end parts that would emit spores, which travel up the tuber in a pulse. The first network to dive into sets up the points on the squab that will spawn tubers, and also sets up the FEM (soft body) data for the squab. I won’t go into details on the two bottom right network branches: These are selecting some points that are fixed for the FEM solver, and mostly standard nodes created by the FEM Organic Mass shelf tool. 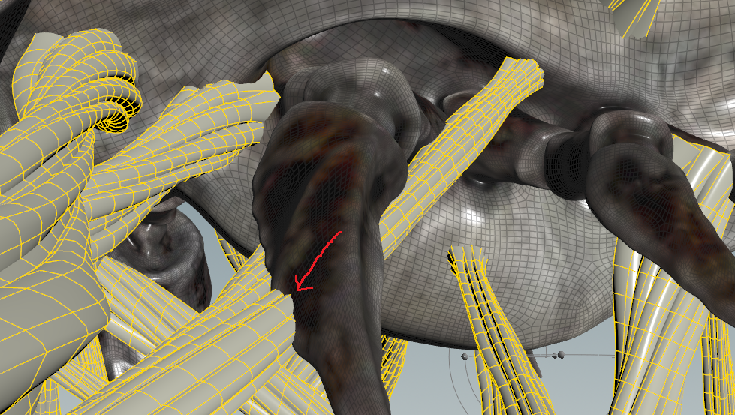 The left “Tuber points” branch scatters some points on the squab body, taking the normals from the surface. I didn’t want many tubers coming out towards the front of the squab, so I deleted points based off the magnitude of the Z component of the normal (a Z value of 1 means the point is facing straight forward in “squab space”, since the squab is aligned to the world Z). The next issue is that some of the generated tubers would crash through the squab geometry. The first thing I tried worked out well enough, which was to ray trace out from the tuber points and see if I hit any squab geometry. If I hit geometry, I delete the point. That’s part of what makes it messy. Each iteration of the loop is a sample, the number of samples is a parameter exposed to the network. I use a SampleSphere node to create sample points on a cone around the normal, with an angle of 45 degrees. I use the vector to those points as the raydir of an intersect node, and trace out from the point and see if I hit anything. I store the max of the hitprim into an attribute, and then I just delete any points where this “hitval” is greater than 0 (the default hitprim is -1). You can see that running this pass removes quite a lot of invalid tubers, I didn’t mind it being too aggressive. 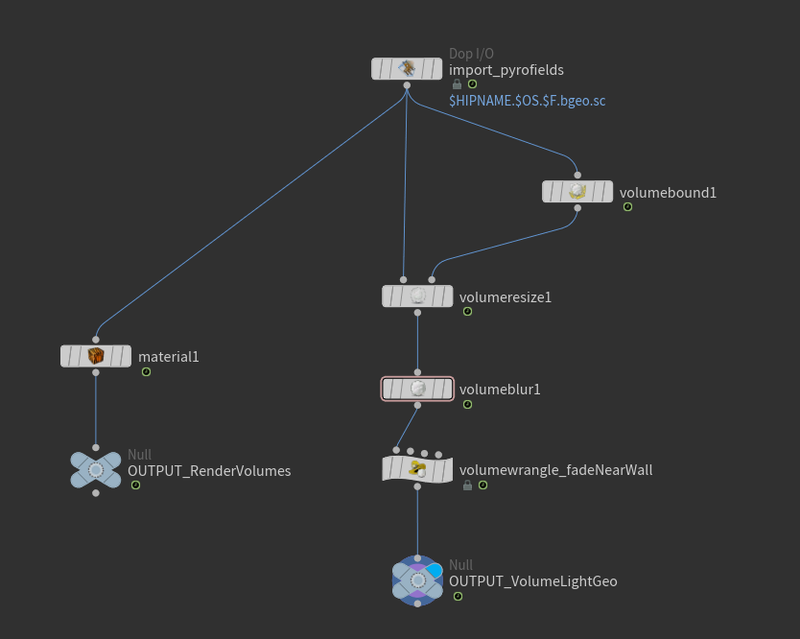 On the main network graph, there are three Transform nodes that I’ve coloured aqua (the ones toward the bottom of each of the three network branches), these are fed data from the “motionfx” CHOPs network. 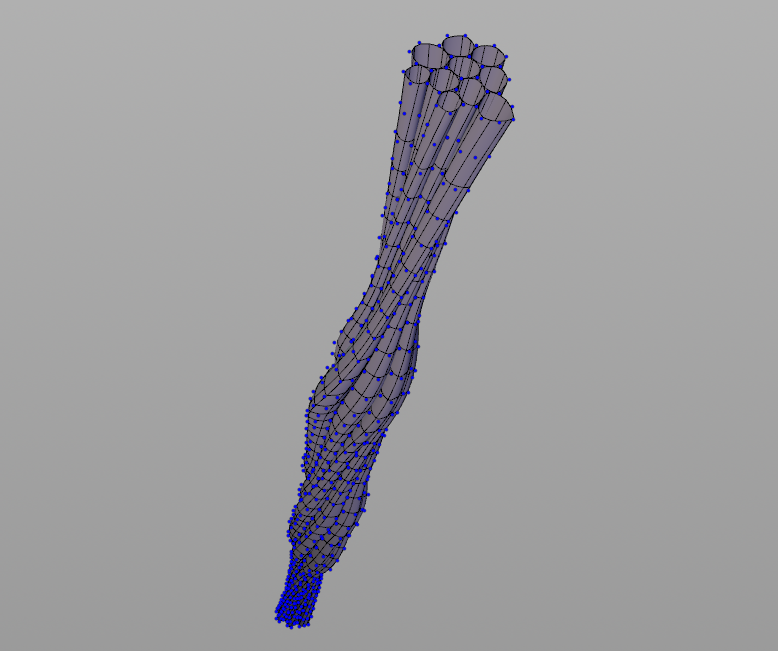 I’m using random noise to move the body of the squab (and the attached tuber points) around. First thing to note, the tuber points and chops body get animated in exactly the same way. Then I merge them together, and work with 6 channels for the rest of the network. The Body Motion group of nodes was largely trial and error: I added a sine wave to some noise, and added some filters and lags until the motion looked nice. That’s over 600 frames, btw. I wanted to get a sort of floating in water currents feel, and I was fairly happy with the result. I also wanted the body to rotate a little with the movement. I tried a few things here, such as a CHOPs lookat constraint, various VOP things. If you imagine the squab body as a single animated point, this is like attaching another point a little below it, and attaching this new point to the first point using a spring. Then, measuring the distance between the points, and using that distance as a rotation. In future posts, I will break down the creation of the tubers, some of the FX work, and also creating the sound in CHOPs! Last post was all about materials, this time around I’ll be talking rendering settings and lighting. Being one of my first renders in Houdini, I made lots of mistakes and probably made lots of poor decisions in the final render. I experimented a bit with Renderman in Houdini, but after taking quite some time to get it set up properly, enable all the not so obvious settings for subdivision, etc, I decided this probably wasn’t the project for it. I ended up using Mantra Physically Based Rendering, and chose to render at 1080p, 48 fps. Well… I actually rendered at 60 fps, but realized that I didn’t like the timing very much when I’d finished, and 48 fps looked better. I wanted two light sources: an area light in the roof, and the explosion itself. Both of these I just dumped in from the shelf tools. 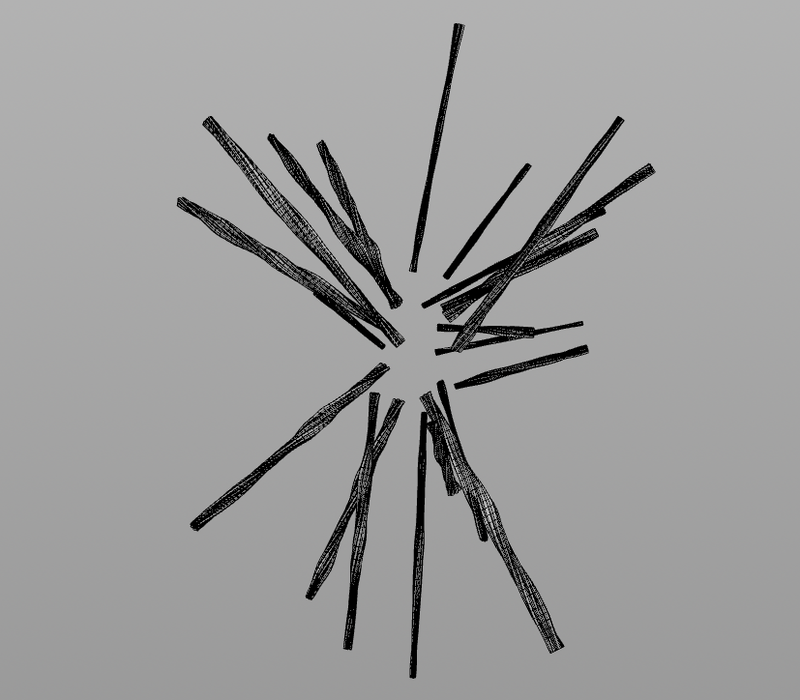 The explosion lighting is generated from a Volume Light, which I pointed at my Pyro sim. I was having quite a lot of flickering from the volume light, though. I suspected that when the volume was too close to the walls, and probably a bit too rough. So between a X value of -75 (just in front of the wall) to -40, I’m fading the volume density up from 0 to 0.2. After that, I had no issues with flickering, and the volume lighting looked the way I wanted it! I think that’s it all covered! Frame render times between 10 – 25 minutes each. Full animation took about 154 hours to render. Plus probably another 40-50 hours of mistakes. My PC is a i7-5930k with a NVidia GeForce 970.